No. 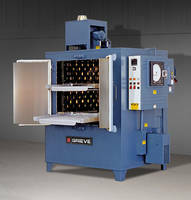 979 is a 850ºF (454ºC), electrically-heated, universal style oven from Grieve, currently used for various machine shop heat treating operations at the customer's facility. 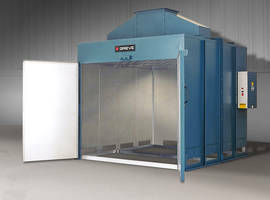 Workspace dimensions of this oven measure 36" W x 36" D x 36" H in each of the two compartments. 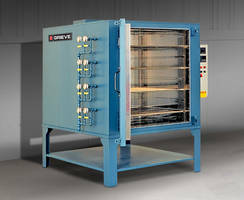 24 kW (12kW per zone) are installed in Incoloy-sheathed tubular elements to heat the dual oven chambers, while a 600 CFM, ½-HP recirculating blower provides front-to-back universal airflow to the workload in each compartment. 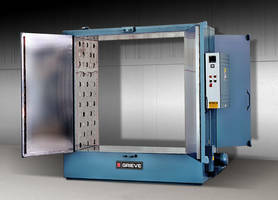 This Grieve universal oven features 6" insulated walls, aluminized steel exterior with enamel finish, Type 304 stainless steel interior, double doors, three roller shelves rated for 200 lb. loading, five nickel plated, 100 lb. 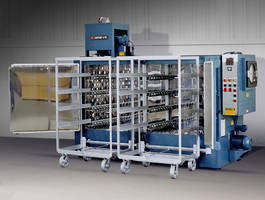 capacity shelves in the top chamber, three nickel plated, 100 lb. capacity shelves in the bottom chamber and an integral leg stand. No. 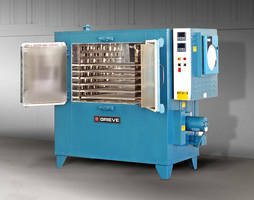 979 controls include a digital indicating temperature controller for each compartment, recirculating blower airflow safety switches, a 10" diameter circular chart recorder for each compartment to record part temperature and manual reset excess temperature controllers with separate contactors.